When your home and property are clean and have great curb appeal they are more inviting to visitors and have greater value. Regularly schedule pressure washing service is a great way to keep your home in Tyler, TX looking great year round. In the same manner, contributing to the environmental cleanliness of your neighborhood and city adds to your homes value and the overall prosperity of your city. That is why it is important to select a pressure washing company that is as environmentally friendly as it is effective. As Good Stewards of the environment, Poseidon Power Washing is proud to be the most environmentally conscious pressure washing company in Tyler, TX. Obviously, you can’t perform any type of pressure washing service without water. But as a valuable resource, the water table should be protected, especially during the summer months that are prone to drought conditions. 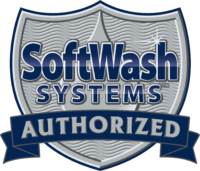 To protect the water table around your home our pressure washing teams are always cognizant of our waste streams, not just complying with, but going beyond EPA and the CWA standards. In that way, we help make sure your towns water supply will be there when you need it the most. Whether we are pressure washing your driveway or performing our soft wash roof cleaning service, some form of cleanser or chemical is applied to clean the surface. At Poseidon Power Washing we don’t simply use the cheapest chemical we can find, we put much thought and research into choosing the finest in environmentally friendly or bio-degradable chemicals that not only keep your property looking great, but that also do no harm to the environment, animals, or people that they may come into contact with. While we constantly deliver outstanding service and pressure washing results that you just can’t get anywhere else, we pride ourselves on our dedication to the environment. Our pressure washing technicians work hard to make sure that you and your family will have a home that looks great now and an environment to call home for life! So if you are looking for a professional power washing company in Tyler, TX to power wash that dirty driveway, wash your home, your roof, or all of the above you can count of the environmentally friendly expertise of Poseidon Power Washing to the job done right!